Villa in Los Caños de Meca of 1000m2 plot next to the countryside and the beach. 60m2 villa located on a plot of 1. 000m2 with sea and mountain views. Its location is privileged since it has practically no neighbors, on the one hand, the plot, adjoins a huge plain with wonderful views of the sea. It is attached to the Natural Park of La Brena and the beach Trafalgar lighthouse and the other side is a plot unbuilt. An excellent place to unwind body and mind. Recently built and with all furniture, appliances and very new fixtures. The house has one bedroom with double bed, the sofa becomes a comfortable double bed, the kitchen is fully equipped, with respect to appliances and the other necessary items. The bathroom is complete and as the rest of the property practically brand new, the lounge has Freeview decoder. Wifi works on the whole plot, not just inside the house. Satellite channels in different languages. The plot is planted with grass and has fruit trees, we have also preserved asparagus, and mushrooms tagasninas in the original conditional on the plot. The property has a barbecue and garden furniture (chairs and table). The villa is located in the gated community where very few neighbors living and is surrounded by countryside. 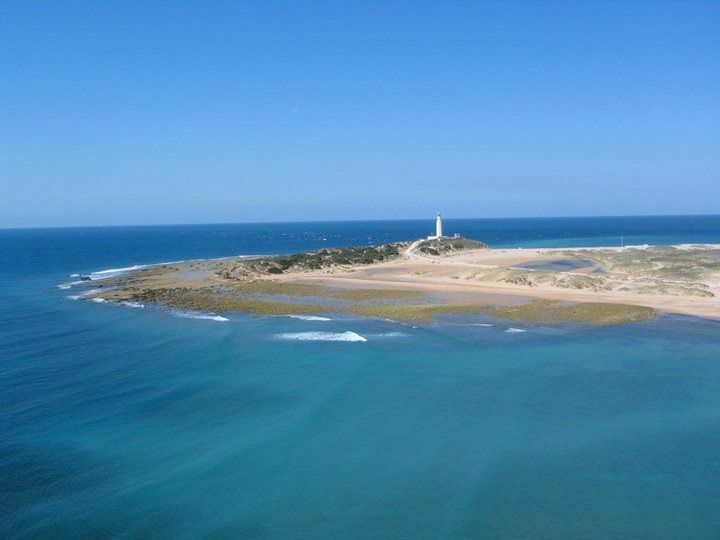 Just 5 minutes walk, are incredible beaches are the Lighthouse Trafalgar, Zahora and Canos de Meca. A few minutes drive are those of Conil, El Palmar and Mangueta, and wonderful coves to enjoy this part of the Cadiz coast. Nearby are villages of great charm as Vejer de La Frontera, Conil and Zahara. In short, they have everything you need to enjoy an unforgettable holiday in a privileged environment. Becomes exclusive without losing the essence of the environment and at a very competitive price. This villa is also a delight in autumn, winter and spring where you can enjoy nature in its purest form, deserted beaches and pleasant to stroll along the beach or hiking trails through the Natural Park of La Brena temperatures. Full, very clean and recently built bathroom. The only interest is that you can spend a pleasant and unforgettable vacation, you can not find or need, we will try by all means to meet you. My wife and i hade a lovely and peaceful week there in January 2019.we even met the cows.no dogs barking. Spacious garden, covered terrace good for sundowners with views over open land to sea. We have 2 dogs. There are brilliant walks along miles of sandy beaches and dunes, one section a walk away, the rest a very short drive. Useful little bars at various stopping points. There are also woodland trails behind Canos de Meca. The garden at this property was large and simply done in grass, well fenced and walled too so our dogs were safe. In October some restaurants are shut but many are open, and our favourite was Venta Curro in Zahora which served fabulous fresh fish. Ein ruhiger,erholsamer Urlaub. Perfekt zum runterkommen. Danke Ihre positive Kommentar. Wir freuen uns Sie wieder bei uns zu sehen und wir sind zufrieden weil Sie eine schoene Aufenhalt bei uns gehabt haben. Es war eine unvergessliche Woche: Ruhe, den Leuchtturm von Trafalga im Blick, am Abend ein Gläschen Wein auf der Terrasse oder einfach auf den Liegestühlen liegen und den Sternenhimmel beobachten. Raúl und Irena haben uns herzlich in Empfang genommen und als es ein kleines Problem gab, wurde es sofort und ohne viel "Tam-Tam" behoben: wunderbar! Der Ort ist zudem ein guter Ausgangspunkt für Ausflüge nach Jerez, Cadiz oder einfach nur um eine ausgedehnte Strandwanderung zu machen. Wir würden auf alle Fälle wieder kommen und können das Haus nur empfehlen! No engañan las fotos es todo lo que se ve, solo un pero, a la playa se pude ir andando desde la Puerta del Sol..
Muchas gracias por su comentario, la casa se encuentra a 700 metros de la playa del faro trafalgar, tal como indica el anuncio. La mitad por la urbanización privada cabo de trafalgar y la otra mitad por la carretera del faro trafalgar con zona peatonal. Gracias a estar no tan cerca de la playa esta junto al parque natural de la breña y se tiene los dos entornos muy cerca. Un cordial saludo y estaría encantado de volver a recibirle!! Excluido Semana Santa, Navidades que se aplicarán las tarifas de temporada media.